Welcome to Finals Week, where procrastination rules and sleep is but a figment of your imagination. No one likes Finals Week. It’s that period at the end of the quarter or semester (whichever system your school follows) where you are either doing something or you’re not. I go to a school where there is no “Dead Week” (about a week between the last week of actual instruction and exams, designated for studying), and right after the last day of classes, we are thrown into the gauntlet. And let me tell you: the gauntlet feels more like a slow drag through gravel. You either have in-class finals or take-home finals, or a nice and deadly combination of both. I have that combo this quarter. Take-home finals are the absolute worst. You either finish them right away or you take…days…to…finish…them. It’s no secret among my friends that I am a huge Star Wars fan. I was that annoying kid who walked around the halls of her elementary school breathing like Darth Vader. I attempted to write a Star Wars play in the fifth grade with my friends and demanded I should play Luke Skywalker (the play never pulled through but I still have my dreams). When Disney announced their merger with Lucasfilm, I kind of got really excited because, hey, more Star Wars movies! A bigger Star Wars presence at Disneyland! Yay! With this merger with Disney came the erasure of the Star Wars expanded universe developed between the original trilogy and the prequels and continued even after the Revenge of the Sith in 2005. Thankfully, I wasn’t too well versed in the expanded universe enough to have extreme emotions about this, but I was still really bummed that my favorite Clone Wars cartoon on Cartoon Network was no longer considered canon (I am sorry, Genndy Tartavosky. I still love you). However, as Disney and Marvel are good friends, they released a new series this year written by Jason Aaron. There are currently six issues. This series takes place between A New Hope and The Empire Strikes Back. I always wondered what happened between those two movies. 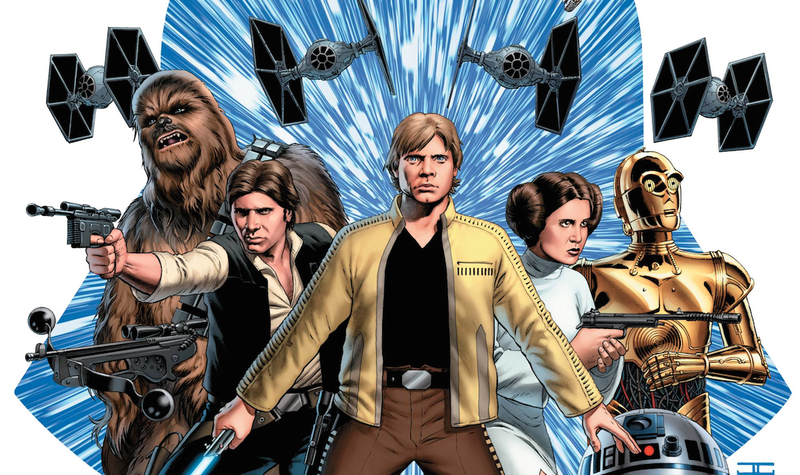 There are also two other series that are running concurrently with this one – Princess Leia (another great read) and Darth Vader (which I plan to read this summer). This is a big year for the Star Wars franchise (I MEAN, EPISODE VII COMES OUT IN SIX MONTHS. HOOPLA), and re-establishing Star Wars as a part of Marvel was a great idea. These comics are definitely a breath of fresh air and gives fans a chance to jump back into the universe. I felt like I was at home as soon as I saw the first two pages emblazoned with the phrase “A long time ago, in a galaxy far, far away…” and saw my favorite characters in action. The art and writing are spectacular. They’re just a great tie-in to the Star Wars canon. I’m definitely one of those people who cry while watching theme park shows. I don’t know – I just get overly emotional about them. The first time I watched World of Color at California Adventure, I was a sobbing mess. Thankfully, I got splashed with enough water (I was in the very front row) that my tears were obscured and I saved myself from embarrassment. I just can’t help it. I even cry whenever I watch the Shamu show at freakin’ SeaWorld. That being said, I was a mess while watching the 60th Anniversary fireworks on YouTube. Not even at the actual park–on YouTube. It’s a beautiful tribute to the work of Disney Studios, and everything about it from the projections on Main Street and the Matterhorn to the fireworks is simply spectacular. The Imagineers really stepped up their game this year! Without spoiling too much, I just want to say that the Lion King and Winnie the Pooh parts are probably my favorites. Other things: PROJECTIONS! The music! Under the Sea! RING. OF. FIRE. I really can’t wait to watch it live this summer. I am always so floored by the extreme attention to detail at Disney Parks. If I were a computer engineer or visual arts student, I would definitely apply to be a Disney Imagineer…but I’m not. SIDENOTE: Unfortunately, I can’t really say the same about World Of Color: Celebrate (except for the Star Wars segment and other stuff). I mean, what was the purpose of “Let It Go” besides pandering to Frozen fans? I mean I am a fan of Frozen – I saw it four or five times in theatres, but really? In World of Color at a point where it is not even relevant to the overall plot line of the show which already leaves much to be desired? Let it go. 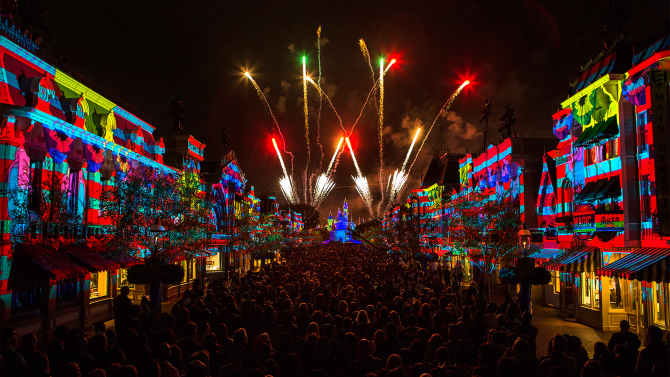 Honestly, I know I’m gonna cry anyway when I get to see World of Color: Celebrate live because I am a huge sucker for heart-wrenching music and COLUMNS OF FIRE. I am allergic to cats, but I really love cat-related things. While scrolling through Twitter one day, I saw a tweet made by one of my favorite artists, Kate Leth. She posted a picture of a cartoon apartment FILLED WITH CATS. I had to seek out that app immediately. Thankfully, someone posted a link to download it from the App Store, and I downloaded it as soon as I could. 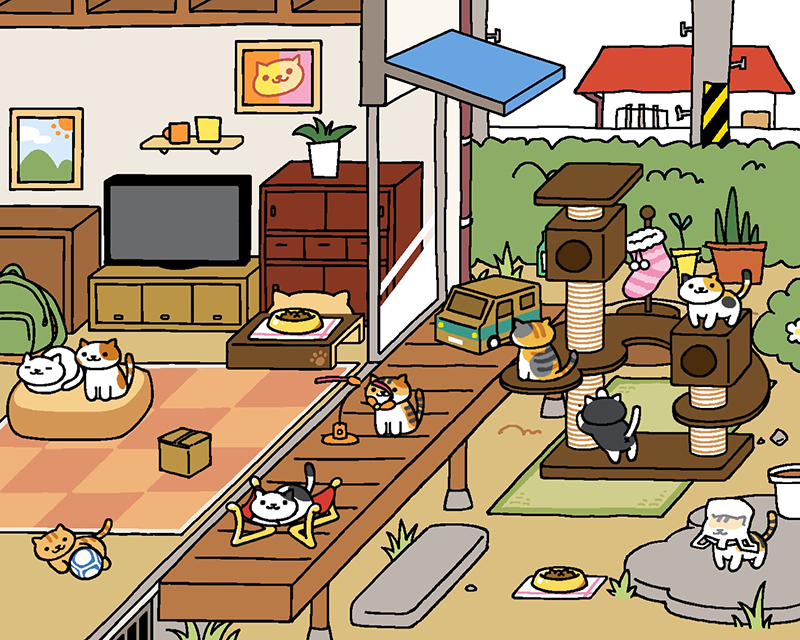 Neko Atsume, or “Cat Collector” (thanks to my friend Anna for the translation), is exactly what it is: you run a small little cartoonish apartment, buy things that cats like (food and toys) using sardines as currency, and attract an array of adorable looking stray cats to your humble abode. One thing, though: the app is entirely in Japanese. I could read some of it (because I did take some Japanese classes before), but not all of it, so I pretty much guessed my way through the app until I figured out how to use it. You can even name all of the cats! Needless to say, I named them all after Marvel characters. I have all but four of the cats in the guidebook. I’m ALMOST THERE. Tiana, give me strength. “Pitiful humans. Feed me.” I named this one Thor, but now, after some thinking… I think this should be named Loki. The main reason why I was so attracted to this app was because I used to be obsessed with an app similar to it: Kawaii Pet Megu, a modern-day alternative to Tamagotchi. It shut down last year. Rest in Peace, Kawaii Pet Megu. You were such a good app. I miss you, my Megu. Never again will I see you wear your perfect smile. 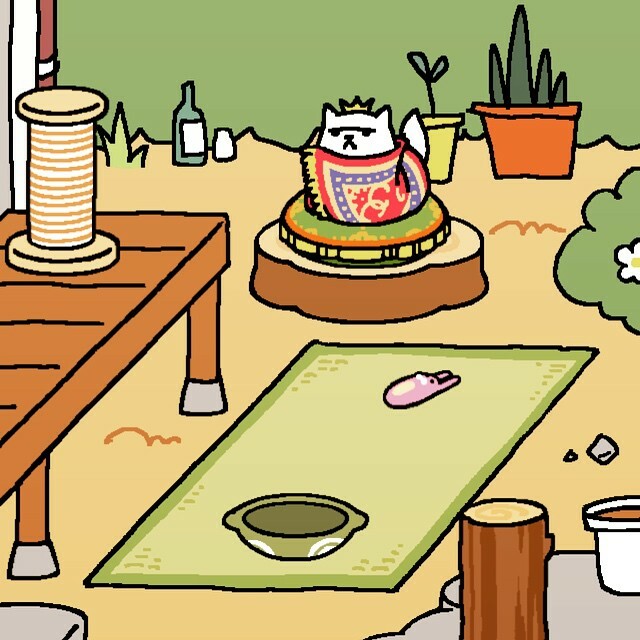 HIGHLIGHTS: Anna Wintour Cat, the really, really catchy music, the art of the game in general. It’s a good stress reliever, unless you are like me with my “Gotta Catch ‘Em All” attitude and really have to make sure you get all of the cats in the guidebook. Well, there you have it – my first “Favorite Things This Week” post! Good luck on finals, quarter system people. May the Force be With You. Happy International Women’s Day! I am blessed to have been influenced by so many beautiful, powerful, and inspiring women growing up, and I want to take this time to thank them for what they have done to make me the woman I am today. 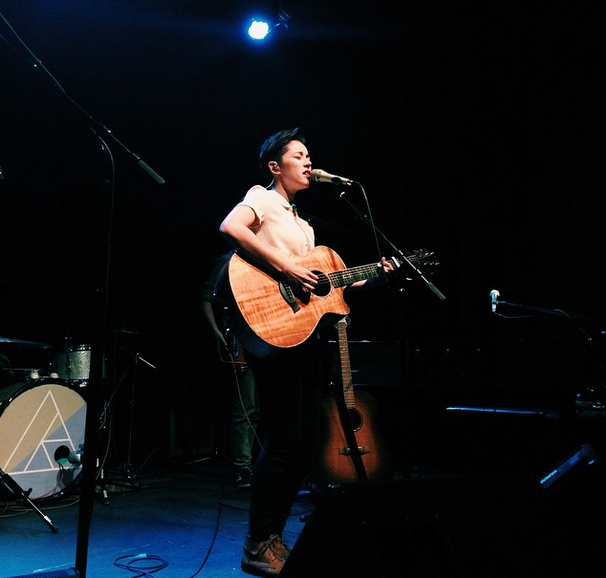 Kina Grannis of YouTube fame, and a SoCal native, serves as a breath of fresh air in a poppy world of spectacle. I started listening to Kina Grannis in high school. The first song of hers that I listened to was “In Your Arms”. I managed to snag the music video when it was free on iTunes. Needless to say, I fell in love with her smooth, unique voice and the amount of detail that went into making the video (which took 22 months to make and 288,000 jelly beans). Here was an artist that was dedicated to her craft. I later discovered her song “Valentine” and pegged it on my favorite television couple at the time (Kurt/Blaine from Glee). After listening to many more of her songs, I became a fan, especially of her covers on YouTube. The rest is history. I followed her on Twitter and have come to realize that she is not just an amazing musician, but a very kind and passionate soul as well, always seeking to connect with her fans. I bought my tickets for Kina Grannis’ La Jolla concert last December amid finals and a whole lot of stress. Instead of working on a study guide like I should have, I watched my desktop clock like a hawk, waiting for the moment it would be noon and I would be able to get my tickets. I managed to snag a general admission ticket and a VIP pass, which was pretty damn amazing. After months of waiting, the day of her concert came. My friends and I made our way to Porter’s Pub (an incredibly small venue on the UCSD campus) and split off as half of my group had VIP passes and the others did not. Along with the VIP pass came a short acoustic set. When Kina came out, smiling, everyone was caught by surprise and in awe as she pulled out her guitar and asked us what we wanted her to sing. She sang her two hits “Valentine” and “Strong Enough” – and her voice, sans microphone, beautifully resonated in the little room. She put a lot of passion into her performance – eyes closed, body moving with the music, it was great to see an artist truly connect with her work. The meet and greet line was a little lengthy, but having the chance to talk to her for a little bit was truly rewarding and felt like everything came full circle for me as someone who is very passionate about music and performance. She’s the absolute sweetest. I say this about a lot of artists, but this wholeheartedly rings true for Kina, who takes the time to talk to every single person despite time constraints. He then welcomed Kina to the stage, and she performed a myriad of songs from her albums, Elements (her latest one) and Stairwells (her first one). She truly commands an audience, hopping around her mic and truly getting into her music. Her band also forges a deep presence on stage with her and you can tell that hours of work went into making this tour a success (HIGHLIGHT: her band performing a little parody of a song from Super Mario). Kina did say several times that this show was the last one of her tour, which made it a little more special than others. Tearfully, she described how much it meant that people actually listened to her music and followed her on her journey to success. What stands out about Grannis is the fact that she is incredibly humble and down to earth, and as noted earlier – while she does command a presence, it is neither verbal nor physical – her musicality shines overall. The nuances of her facial expressions and body language are subtle, but hold a lot of meaning and weight. Her show isn’t full of spectacle like Katy Perry or Lady Gaga (who I both love – I would like to say that I am not pitting them against Kina as they are artists in a separate genre category – I’m just stating this in terms of the way their performances are presented. Spectacle can be good. Okay, back to the review. Sorry for digressing!) – it’s very grounded in reality as she also takes us into pieces of her life through her lyrics. This is even emphasized by the fact that she constantly engages the audience in conversation, and invites individuals on stage to sing with her. Watching her perform is a transcendental experience – her voice resonates beautifully (whoever did their sound mixing was an absolute genius, for real) and her lyrics are very real and raw. “Little Worrier”, “Forever Blue”, and “My Dear” were emotional standouts in her raw set. Gratitude rings through every note she sings and you just know that music is her true passion. She serves as a breath of fresh air in a poppy industry that mainly focuses on spectacle. I am super proud of this essay!! The task was to take two articles we read in class and use them to analyze a piece of media. The two articles I used are cited below. I am far from being an expert on this subject, but I love Nicki Minaj. There is no denying that. Last summer, I started watching Parks and Recreation because I was bored. A lot of my friends were tweeting about it and constantly giving it rave reviews, so I decided to see for myself whether or not this would be something I could get into. The first season was a little choppy, and I wasn’t used to the whole “breaking the fourth wall” aspect of it. Plus, the main character was a little kooky, and not in a good way. As many know, it’s hard to kick off a show – especially one that is modeled after The Office. That being said, I remember thinking to myself, “Huh. So this is what my friends were talking about.” I recognized Chris Pratt from Guardians of the Galaxy (one of my favorite Marvel movies), so he sort of kept me glued to my computer screen. I even started falling in love with Leslie more and more – amen, amen I say to you, Mike Schur and Greg Daniels – thank you for your fantastic character development skills. I started seeing a little bit (more like a lot) of myself in her: we are both organized/detail-oriented, a little too lovey, weird as hell, love waffles, and are incredibly ambitious. Needless to say, I fell in love with the character of Leslie Knope. Once I reached the first episode of Season Two, I couldn’t stop. I started watching. Two episodes a day turned into five, and five turned into ten (I had an excuse. It was summer break, hello?). I managed to finish all six seasons of Parks in about two or three weeks (I even asked my friend if I could use her Hulu account to watch Season Six, as it wasn’t on Netflix at the time). Well, crap. I fell in love with Pawnee, I fell in love with every single character on the show – the show’s every little nuance, and all of its beautiful continuity. Most of all, Leslie Knope became one of my favorite fictional characters of all time. I am a little speechless right now. Never before has a character really resonated with me. Tonight, I watched the finale with one of my roommates and my best friend Ali (who called in on Skype). To be honest, I wasn’t ready. All day I was thinking to myself – is it really ending? The other day, I got extremely emotional finding out that Glee had finished filming (strangely, I am behind on the show and any news about it, so – wow), so clearly I was in denial that Parks was ending too–way before its time. Unlike Leslie, I’m pretty flexible when it comes to change. If it’s good change, okay, then so be it! If it’s not – then, well, screw it, it’s not happening (or so I demand). Either way, I accept change in the end. Whether it is moving to another country, changing plans, making split decisions – I accept it all. However, pop culture is a little bit different for me. Like Leslie, I am very sentimental. My life is always sent into a tizzy when something leaves/ends/changes. Everything changed when Harry Potter ended – many peoples’ lives changed as it was the story of my generation, when Cory Monteith passed away almost two years ago – changing my perception of life a little and how to live it; also questioning many choices I made my freshman year of college. I even felt a little twinge of sadness when my friends told me that Naruto ended even though I hadn’t read it since high school. All of these elements were a part of me growing up and changed me in some way, and they were all gone. I didn’t like it at all. I still go back and read old (quality questionable) fanfiction I wrote and revisit old social media accounts to laugh about how dumb I was at the age of 12. The things I loved losing their pop-culture relevancy in life — I mean, they’re still very prominent, yet not there anymore, you know — was a little scary. It showed that I was growing up, that the passage of time was faster than I thought. I eventually accepted that these things were slowly fading in the world, but would always be a part of me. Parks and Recreation came to me at a time where I was questioning everything I did. I was doubting myself a lot – I just finished with my second year in college and I didn’t feel like whatever I was doing was enough, felt under-appreciated, and always stressed. I felt that I wasn’t, well, good enough for anything or anyone. It’s all a bit daunting when you’re alone with your thoughts for months on end (and boy, was my summer really f**king long) without being able to articulate them properly. Leslie Knope showed me that despite all of my flaws, it is okay to brave them and be yourself. I’m not going to deny it – Leslie is a flawed character and that’s what makes her seem so real to viewers. She makes rash and bold decisions, and sometimes doesn’t listen when people try to give her advice. However, she makes up for these minimal “flaws” by being positive and being dedicated to making change happen in a town that didn’t really respond to her kindness very well. Despite the ignorant dweebs in her public forums, the bureaucratic mishaps, the patriarchy stomping on her – she proved that she could hold her own against the Mighty Boys Club Of Government. She was organized, paid strict attention to detail, and planned out her every move. Her self-assurance as a feminist, a woman searching for equality in this messed-up world, made me fall more in love with myself and pursue my goals. She showed me that it’s okay to fall down because you can totally get up again. It’s okay to have a hectic, busy schedule because once you check off everything on your to-do list, everything will be so much better. It’s okay to be a woman with ambition in a world that doesn’t seem to play the right cards for you. Winning is the only option, unless you lose – so come up with a contingency plan. It’s okay to care a little too much, because who will? Eventually, everything will be okay. Naturally, it was hard to say goodbye to Leslie Knope and all of the colorful characters of Pawnee. Watching the final episode and seeing all of the characters’ futures inspired me: work hard, play hard – in the end, everything will be okay. Nothing is ever calm and normal. The show proves that people, despite their differences can work together to make things happen. I only hope that my future holds something as colorful and inspiring. Good things always come to an end, but they’re never really gone. Eventually I will accept this. In the meantime, there is always Netflix. 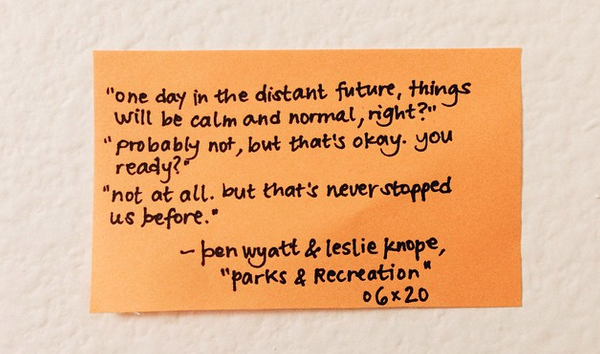 Parks and Rec, thanks for being my constant. Thank you for bringing me so much joy. I will love you and I will like you forever. Hello, there! My name is Leslie Knope. Just kidding. 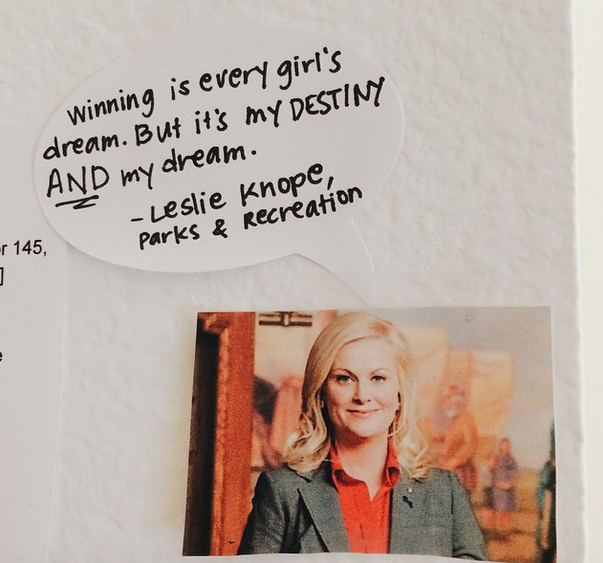 Sometimes, I wish I were Leslie Knope – but I am perfectly content with being myself. My name is Samantha Andico and I’m a 21 year-old student currently attending a university in Southern California. This is my third attempt at keeping a blog purely for writing. Hopefully it all works out, especially since I have a better idea of what I want to talk about here. I’ve always been a huge fan of popular culture – whether it be movies, comics, television, music – and as a communication major, I get to write about it a lot. I’m thinking about using this space to share some essays from my media studies classes, write about my favorite TV shows and films, just take a huge smorgasbord of things I like, and write about them. I will probably write about college life as well for those who are curious about university life in SoCal. So, welcome aboard! This is my world. I am a huge fan of Beyoncé. I would love to emulate her confidence and her independent and loving spirit. My friends and I were joking around on Twitter one day and I joking called myself “Samiyoncé”, and it stuck. “Samiyoncé” sort of serves as my “Sasha Fierce” of sorts – while emulating Beyoncé’s fabulousness, I want to find that same ferocity inside myself. Hence, Samiyoncé – the best of both worlds (tl;dr: having a role model is great – but you also have a lot of potential as an individual).